Hold Fast Hanger to Seek Crowd Source Funding. On Target for Summer Availability. Hold Fast Hanger is a unique product that provides previously unseen space efficiency in the closet and further allows users to take this efficiency anywhere they go. Hold Fast Hanger will seek crowd-source funding. Crowd source funding provides us the opportunity to gauge the pre-production interest in this very new and different product. Hold Fast Hanger announces that it will seek funding through the popular crowd-source funding website Kickstarter.com. Hold Fast Hanger has received a very positive pre-production response. "Crowd source funding provides us the opportunity to gauge the pre-production interest in this very new and different product. We're very excited about the response we have already received," explained Katie Kneapler, Marketing Director for Hold Fast Hanger. Look for the Hold Fast Hanger in the coming weeks. 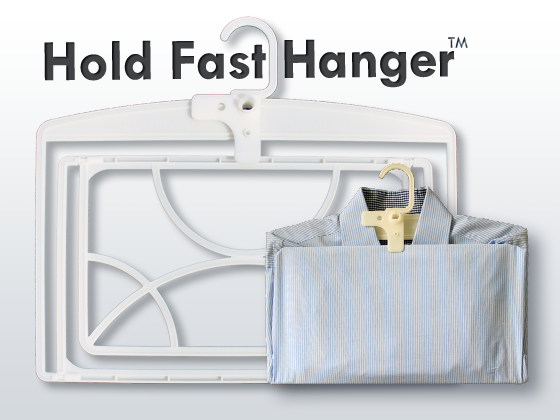 The Hold Fast Hanger is a clothing hanger specifically designed for shirts and to manage the closet space they consume. It reduces the vertical space needed to hang shirts from 36 inches or more, down to 13.5 inches. It has a rotating hanger hook that makes it easy to pack folded shirts in almost any size bag or suitcase without removing the shirt from the hanger. When unpacking, the hanger hook simply rotates back up allowing the user to re-hang their shirts in the hotel closet. The structure of the hanger helps prevent wrinkles, this reduces the need for ironing. It's perfect for taking your shirts in a gym bag for those pre-work workouts. 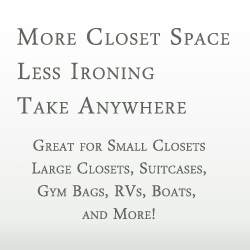 It turns small closets, even those in campers, RVs, and boats, into highly functional spaces. The Hold Fast Hanger is simple to use but it is not simply a hanger. It is a unique product that provides previously unseen space efficiency in the closet and further allows users to take this effiency anywhere they go. Hold Fast Hanger was designed, developed, and will be manufactured all in the Tampa Bay area of Florida. Production is slated to begin in Summer 2012. For additional information email info(at)holdfasthanger(dot)com.